I wash my hair between 2-3 times per week. You read that right. My hair is color treated and dry, and if I wash it too much it gets really heavy with product build up. Now, that doesn't mean I shower 2-3 times per week. It's funny how people jump to that conclusion. But I try to keep my hair as dry as possible on those other days and sometimes only use water to rinse my hair out. The secret to keep your hair looking fresh for 3-4 days is a good dry shampoo. With a good dry shampoo I can easily go for 4 days without washing. Some people think this is gross, but I have noticed that since I started limiting how often I shampoo, I have much more shiny, healthy, manageable hair. Here I washed my hair in the morning, and then took the pictures at night on days one, two and three. I didn't shampoo my hair until the night of day four. These are really weird photos of the top of my head, but I used dry shampoo every day (because I love the way it volumizes), and I wanted to show how you can't even tell. Right now I am using the Not Your Mother's Clean Freak, and I am super happy with it. It might be my favorite that I've tried so far. I think it goes on very well, soaks up excess oil (but not too much! ), and brushes out cleanly. It also has a nice scent. A close second is the Dove Style+care. That one has a nice, clean powder scent, and the shampoo itself is very fine. 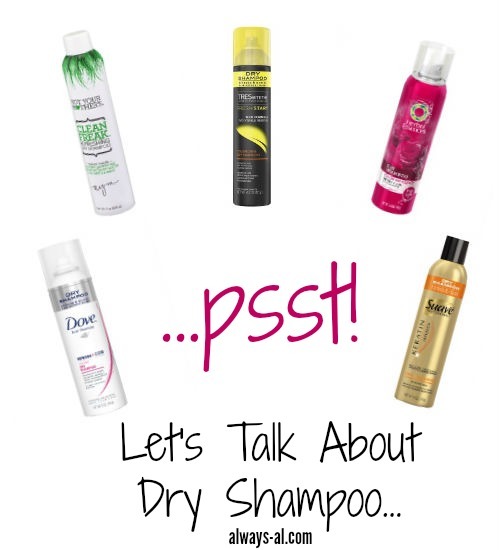 Do you have any favorite dry shampoos? How often do you wash your hair? Would you ever consider going longer? Would you be interested in seeing a tutorial about applying dry shampoo? I'm probably the only girl in the world who hasn't tried dry shampoo. Seriously, what am I waiting for?! lol! I have to wash my hair every other day or it gets oily looking and I do dye my hair so this tends to dull my color a bit. I really need to try one of the ones on your list! Mom said that you were just as addicted to dry shampoo as I am...I didn't like Not Your Mother's though...weird scent. I am currently using Batiste and am loving it (though it is a bit more expensive than the drug store ones). The other ones that you have on the list are ones that I am eager to try :) The most high end one that I want to try is Oribe...maybe one day. thanks for the great tip! I wash my hair everyday and this would help keep my hair in good condition, would like to try. My daughter uses dry shampoo a lot. She's tried them all and actually likes the one I make better than the store brands. I use them occasionally. I have dry hair, too. Right now I'm using Oribe's dry shampoo, it's super expensive but was a splurge I made last fall. I use it 2-3x a week and still haven't gone thru the whole bottle!! I really need to start using dry shampoo. I have tried 2 and didn't really like them. I know it's better for my hair to not wash it every day but my hair gets so oily that I can't help it. After reading this though, I really want to try the Not Your Mother's one. Thanks for the recommendation! I love dry shampooo. I've used TRESemme but have't tried other brands yet. You definitely need to! I'm finding that they are different for all people, so I'd love to know your opinion! I've never tried batiste but there's an urban outfitters by me and I should get some! What's your favorite scent?? Oh definitely. At least every other day!! Yeah I always get iffy about stuff from stores. I've tried some of their make up before and liked it though. Hit or miss I guess! Oh yeah! How do you make your own? If love to try something like that! Haha that's interesting!! I'm not quite to the once a week point, but I have pretty long hair. I hate that misconception! I mean, if you get your money's worth! Where did you get it? Oh you definitely should! It's great for keeping it clean and adding volume. And let me know if you do! I've gone through the brands throughout the years. It's kind of fun to experiment! Mix all in a bowl and keep in a sealed container. I have the wild one at home..but I hear the tropical sent is great!